Working on the knife design and reading up on other threads (https://www.middleearthrangers.org/forum/viewtopic.php?f=28&t=4095) had me inspired to take on yet another design project in regards to the Ranger character/persona I'm (with an admitted great deal of struggle) trying to develop. Sûrcrist, aka "Windcleaver" is a Dunedain arming sword forged in Rivendell for a ranger named Aeberen, whom passed it on to his son Aethir. With this, I'd also like to drop a mention that I'm available to do commission designs for other weapons at reasonable prices. Drop me a DM if interested. "Give me strength, not to be better than my enemies, but to defeat my greatest enemy, the doubts within myself. Give me strength for a straight back and clear eyes, so when life fades as the setting sun, my spirit may come to you without shame." 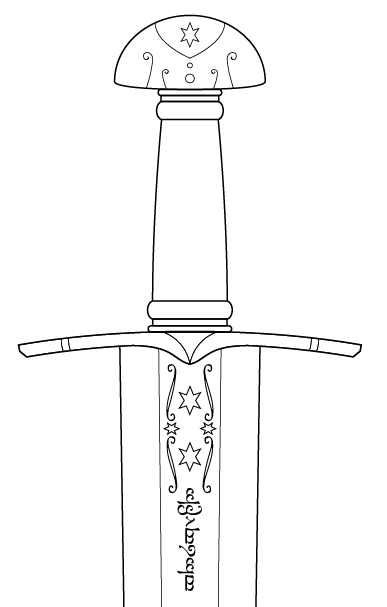 Re: Custom Ranger Sword- "Sûlcrist"
Also I love the general form: I think we're narrowing down on a nice book-friendly aesthetic, which is all kinds of cool. One thing I did run across in the research for Elenglin was that the only references to characters on blades I could find was I believe in cirth runes. (Narsil/Anduril of course: I fear I can't remember others. though admittedly that's a very special case). Anyhow, none of that's not to say you should choose the same path, but those were the roadbumps I hit. If they provide valuable places to explore - great! If not, oh well. I look forward to seeing what you end up with! Nice work; being a CAD technician myself for the last 30 years (and designing lots of weapons for fun), I can appreciate the effort. My computer froze halfway through a save and corrupted the file. I HAVE TO START OVER. I'm heartbroken. I feel your pain; that has happened to me also, more times than I care to remember. One nice thing about AutoCad is that it will usually save an .$V$ file in the hidden AppData folder, which although might not be every update that was made pre-crash, it typically does save a lot of extra work restoring the original.